Another one searching for a Myford ML8 clamp bolt ! I have been visiting the forum for a while and have just signed up. Im a Brit living in the north of france within sight of the cliffs of Dover who loves finding old machine tools and restauring them. I recently popped over to collect a 1940s series ML8. It is now up and running 3 phase with vfd. Much better than the old tiny bench top 1900's metal type lathe that i had been struggling with. However there are 2 things that are missing. The two (2 of 4) clamp bolts for the bowl turning extension and the bowl tool rest . I would post a few photos but dont seem to be able to yet . I found a topic by simonturner - 17 May 2014 - "it was a triple start thread measuring 20 TPI on a thread gauge ie a pitch of 0.150" with an OD of 0.370"
The references on the exploded diagram are 71 and 77. My 1890's metal lathe is not yet operational so cant make them myself. Does anyone know if they are still out there or is it a case of make them or find someone who can? If anyone is interested in helping i'd be very happy. I've got a whole ML8 in spares including the bowl turning attachment if you fancy it. I could also make them up if that suits more. Although I'm not quite sure what bolts you're talking about, are you talking about the two clamping arms which lock the tool rest and swivel in place? Yup, this are the ones. As soon as I have the permissions to add photos I'll do it. I also have almost an entire ML8 in spares, I think it's just the motor and head that I'm missing, so probably have those bits. Sounds good, if you are willing to part with the bolts, I'm game. Tho you'd be missing 2 important bits if ever you wanted to sell it on. I'd also be happy to pay someone to make a new pair based on the old ones. Do you just want the bolts or the clamp arms with the balls on the end as well? If it’s just the bolts you’re after they’re easy enough to make. Hi, just the bolts, everything else seems to be in the box of 'bits'. I find the bowl turning attachment a bit limiting, id like to do larger diameter or longer peices but the arm doesn't have enough clearance. Il have to make up another rest. If you are interested in making a couple that'd be v kind. "triple start thread measuring 20 TPI on a thread gauge ie a pitch of 0.150" with an OD of 0.370"
A triple start thread is very unusual, I'll have to have a good look at mine. That being said, I always like a challenge. Sometimes. If it is triple start and tricky I'd be up for buying the originals off you. I've just got back from having a look at mine, and indeed they are triple start threads. I suppose it should come as no surprise since they're fast at tightening and loosening off. I'll have a go on some scrap first and see whether it's doable on my machine, shouldn't be too hard. A possible solution might be to re-cut the thread on the round cylindrical nut, (or make a new one if you don't want to mangle the old one). If you re-cut the thread then you can choose the thread you want. You won't get the rapid locking action of course, but it might work for you. 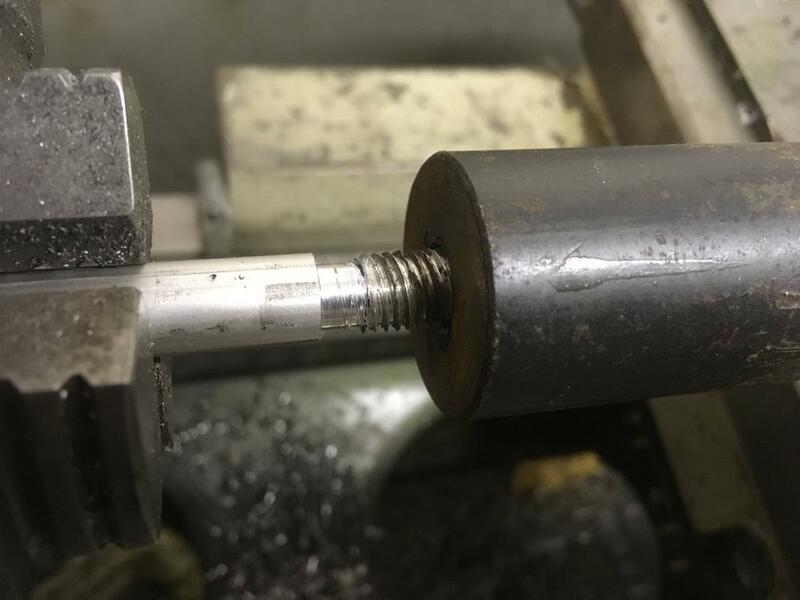 If you drill 2 holes through the cylindrical nut at 90 degrees to each other, you could then use a removeable tommy bar to tighten up, even if it takes several turns. That is what I am planning to do with mine anyway. Whatever the solution, it might pay someone to make a few - there were 100,000s of ML8s sold so there must be a market for some. Worth sticking a few on evilbay? By some kind of divine miracle, I managed it on first try! Bit of a pig to work out how to do it (I'm no engineer) but I managed to figure it out, without google! Quite proud of myself! Good work, is that in alu?